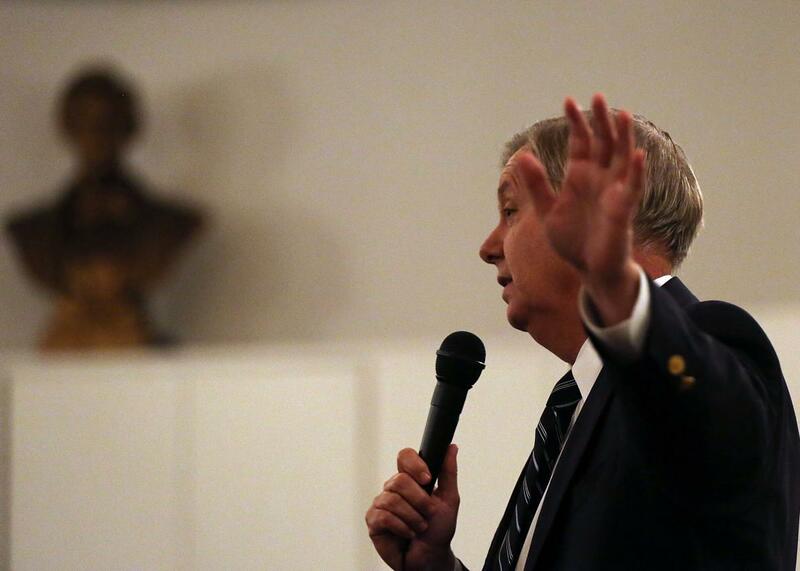 Voters had no interest in Lindsey Graham plan for total war against ISIS. Lindsey Graham Was the Only One With a New Plan to Defeat ISIS. No One Wanted to Hear It. Republican Presidential Candidate Lindsey Graham speaks at the Metropolitan Republican Club on November 19, 2015 in New York City. Over the past few weeks, we’ve written several posts noting that for all of their criticism of the Obama administration’s handling of ISIS, none of the GOP candidates are proposing anything dramatically different when it comes to fighting the group in Iraq and Syria. Sure, the president may be a “feckless weakling” and they may want to make the sand glow, but when you get down to the details, most of their plans are, at most, tweaks of the existing strategy of airstrikes backing local ground forces with some involvement of embedded U.S. special operations forces. The one notable exception has been Sen. Lindsey Graham, who on Monday pulled the plug on his struggling presidential campaign after failing to ever garner more than 2 percent support in national polls. Where the other candidates have been vague, Graham has gotten specific, calling for a force of 20,000 U.S. troops to deploy to Iraq and Syria alongside a regional army from Egypt, Turkey, and Saudi Arabia to fight ISIS. Alongside his friend and ally John McCain, he has gone farther than any other candidate or the current administration in calling for the removal of Bashar al-Assad by force. Whether or not you think this strategy is a good idea (I don’t), he, along with Rand Paul on the other end of the foreign-policy spectrum, deserves credit for not just attacking the Obama administration for failing to defeat ISIS, but suggesting an alternative course of action. GOP primary voters, however, seemed to have no interest in Graham’s ideas, despite the fact that a large majority of Americans disapprove of the president’s handling of ISIS and a narrow majority now favor ground troops. It’s possible that Graham was simply the wrong messenger. In this election cycle, a veteran, establishment senator with a moderate record on immigration reform and seemingly no interest in talking about domestic issues was never going to win the nomination. And his cranky, hectoring debate performances were more amusing than beneficial. But it’s still remarkable, given the degree to which the fear of terrorism is driving this race, that Graham’s uber-hawkish approach couldn’t even get him onto the main debate stage, and that none of the stronger candidates have adopted anything close to it. Graham brought voters a real alternative to the Obama administration’s approach and made clear it would be difficult and involve major sacrifice. It wasn’t what anyone wanted to hear.